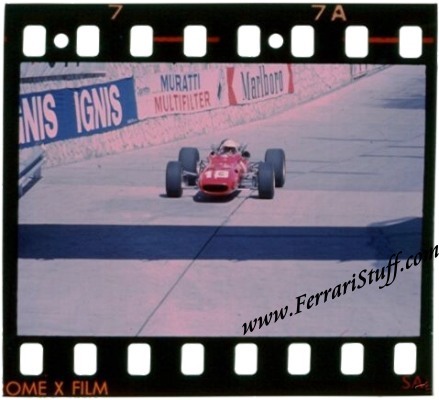 << Back Vintage 1967 Color Slide - Monaco Grand Prix - Lorenzo Bandini's last lap ! Vintage 1967 Color Slide - Monaco Grand Prix - Lorenzo Bandini's last lap ! Vintage 1967 color slide of Lorenzo Bandini in his very last lap at the Monaco Grand Prix on May 7, 1967. In this picture we see Lorenzo heading towards the Portier turn in lap 87 of the Grand Prix. An Italian team leader at Ferrari, Bandini was under considerable pressure to perform. At Monaco in 1967 he was lying second late in the race. On lap 82 of the scheduled 100, probably due to fatigue, Bandini misjudged his entry to the harbour front chicane. The Ferrari clipped some straw bales and overturned, on fire and with Bandini trapped inside. The raging inferno made rescue difficult, a situation not helped by a TV helicopter fanning the flames from above. Eventually, Bandini was removed and taken to the Princess Grace Hospital, terribly burned. He held onto life for three days before eventually succumbing. In a cruel postscript, Bandini’s wife, expecting the couple’s first child, suffered a miscarriage. An estimated 100,000 people attended Bandini's funeral. Since this is the original slide, it comes including the copyright so the buyer is free to reproduce it, also for commercial purposes!